Khululiwe born and grew up at Durban, Umlazi… A wife to the South Africa’s foremost African Music Legend, High Priest the late Jabu Khanyile. Khululiwe’s long and triumphant path and bravery in tackling music that shows her experience gained in working and performing along side Africa’s and the world’s greatest musicians, such Jabu Khanyile, Letta Mbulu, Salif Keita, Angelique Kidjo, Quincy Jones, just to mention a few gave Khululiwe a better insight into what her offering should be to those who appreciate music for what it is. This album could not have come at a better time as the music industry awaits with abated breath the next female artist to break from the pack and occupy the world space already graced by the legendary Letta Mbulus, Mirriam Makebas, and the Busi Mhlongos of Mzansi. An Urban Zulu album with a mix of Afro-Jazz and Afro-Pop, soul and Maskandi this album has been carefully constructed to be rooted both in the urban and Afro traditional sounds, thus making it appeal to audiences who appreciate music for what it is and not what genre it represents. It will equally resonate well in the hinterlands of rural South Africa with songs like Ngomane, featuring Bhekumuzi Luthuli, iMinjunju (composed by Bongani Nkwanyana the infamous composer of Amacala by Siphokazi). The album will also have an appeal in the urban metropolis with songs like News Café, Asilimanga (an adaptation of Mirriam Makeba’s song) and uMahlalela by Letta Mbulu. A star studded session musicians line-up played a key role in the construction of the music as it is evident by who played what instruments in the album, from Isaac ‘Mnca’ Mtshali on drums, Jimmy Mngwandi, Jabu Sibumbe, Bongani Masina, Mlungisi Gegana ( all sharing bass), Gabriel Stuurman, Luyanda Madope and Victor Mbotho on keyboards, whilst guitar is by Steve Zulu (acoustic and electric), Nothi Ntuli and Bongani Nkwanyana on Maskandi guitar. Perhaps one of the young but experienced studio-recording artists to come out of South Africa. Her voice has featured, as a backing vocalist, in most of the sound recordings done by leading musicians in the country to critical acclaim. She has backed and appeared along side South Africa’s greatest artists in festivals locally and abroad. Khululiwe’s first taste of the performing arts was when she was picked by Mbongeni Ngema for the Broadway hit musical ‘Sarafina’ and subsequently ‘Township Fever’, where she did solo performances before following music full time as a her chosen career and profession. A versatile vocalist and musicians who has mastered most of South Africa’s music genres, Khululiwe easily transcends between Afro-pop, Afro-Jazz, Maskandi and urban Zulu music not mention South African gospel. 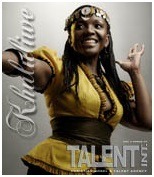 A great choreographer who popularized the late Jabu Khanyile’s front line dance routines of Bayete’s backing vocalists. Khululiwe directed Jabu Khanyile’s last live recording and collaboration with Busi Mhlongo in 2006. Not new to accolades and recognition is evident in the strings of awards and performances such as her feature in the movie ‘Sarafina’ in 1990, gold sales award for her contribution to more than half a million units sold for the Lion King album, ‘Rhythm of the Pride Lands’, nominated for in 1998 for FNB Sama Awards for ‘Best Female Solo Performer’, awarded by His Majesty Zwelithini for her performance at the Annual Reed Dance Ceremony Khululiwe has worked with leading world musicians such as Salif Keita, Angelique Kidjo, Kanda Bongo Man, Quincy Jones, Papa Wemba, and has backed artists such as Busi Mhlongo, Letta Mbulu and Caiphus Semenya, Jabu Khanyile, Hugh Masekela just to mention a few. As a solo artist, Khululiwe has performed in Mexico (2003), in Greece at the Greek Olympics (2005), including a duet with the top Czech Republic artist Lucas Fiser in Praque in 2002, Europe and the United StatesA Note from the Artist: I would like to thank the Lord All Mighty for giving me the strength to do this album through thick and thin. Not forgetting ‘izinyanya zakithi oJobe kaMatshana oMondise, behlangene noNgwane kaSogodi.